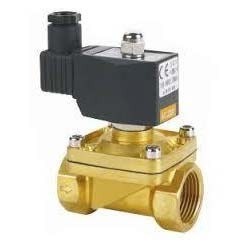 With our rich industry experience and knowledge, we have been engaged in offering a broad array of Solenoid Valve. Our vendors manufacture this valve in compliance with the international quality standards using high grade rubber and other material with the help of cutting-edge technology. Vigorously checked on several quality parameters to ensure its flawless finish, this valve is available in different specifications at industry leading price. “Dharmendra Engineering Company” is the most eminent company that has created a niche in the industry within very short period of time. Our company was incorporated in the year “2013” as a proprietorship based company. We are a leading Trader and Supplier of an optimum quality Nylon Rods And Pipes, Coil Pipes And Tubes, Eco Drive Belts, Pressure Gauges, Air Blow Gun, etc. These products are precisely designed by our skilled and knowledgeable employees by using the best part of their knowledge and experience. Also, they use high grade material, their innovative ideas and cutting edge technology in their manufacturing process. They also keep the customer’s needs and demands in their mind while manufacturing and delivering these products to them. Our employees are dedicated and are an important part of our organization that play an important role in building up a huge client base in a very short period of time. Firstly, they understand customer’s needs and then give their 100% to fulfill their requirements. We are authorised trader of some brand names like Janatics, Pawel, Techno and many more. Our team members provide Pump Repairing Service to our patrons.